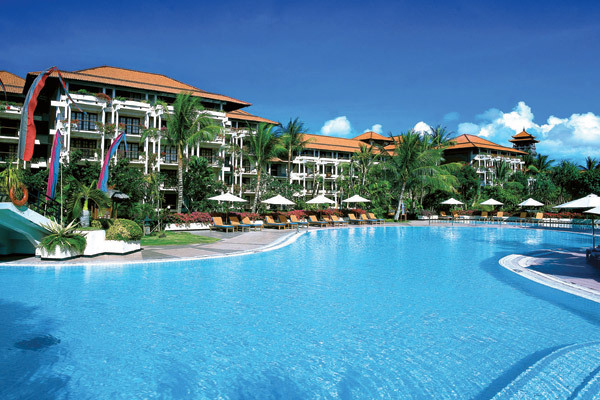 A place of quintessential Balinese architectural style and elegance. Designed to resemble a Balinese water palace, the five-star resort is embellished with stone statues, fountains, and lagoon pools that exude the exotic grandeur of the island. This “Ramayana Epic theme” is reflected throughout the hotel’s luxurious rooms, savory cuisine, rejuvenating wellness services, and first-rate event venues. The Ayodya Palace has 79 spacious rooms and suites with expansive bathrooms, all tastefully decorated with Balinese wooden crafts complete with the ultimate in amenities. Guests have the privilege of accessing the Ayodya Palace Lounge, which houses a private swimming pool and meeting facilities. Services at the lounge include daily complimentary breakfast, afternoon tea, evening cocktails, round-the-clock refreshments, daily newspaper and magazines, Internet access, priority check-in and check-out, and free use of the gym at the Fitness Centre. The exclusive Ayodya Palace is a resort within a resort that provides guests with the ultimate ‘club’ experience. And to ensure this experience is enlivened well, children under 12 years of age are welcome to stay in Palace Rooms, but are not allowed to enter the exclusive Palace Lounge and Swimming Pool. A range of 22 suites are also available for guests looking for the ultimate in high-end living including two villa-style suites complete with their own plunge pools and dining Bales in private tropical gardens. The spacious rooms, overlooking the tropically landscaped gardens, enjoy an area of 56 sqm with elegant decor, teak parquet floors, crafted teak timber furniture and traditional Balinese artwork, sofa chaise and spacious modern marble bathrooms with large bath, separate shower cabin, dual vanities and an elegantly shuttered window to the bedroom. The balcony offers two comfortable daybeds, table and chairs as a private retreat. The rooms enjoy an extensive range of amenities with exclusive Ayodya Palace bathroom toiletries. All rooms feature: deluxe mini-bar, deluxe tea and coffee making facilities, satellite 32″ flat screen TV with a wide range of channels, stereo connected to the TV for in-room movies, Broadband Internet Access, in-room safe, centralized in-room environmental control system, three telephones and a data port. This room type is available in king or twin configurations. Connecting rooms are available. The Ayodya Palace Ocean View Rooms enjoy vistas across the Indian Ocean from individual private balconies. The spacious rooms enjoy an area of 56 sqm with elegant decor, teak parquet floors, crafted teak timber furniture and traditional Balinese artwork, sofa chaise and spacious modern marble bathrooms with large bath, separate shower cabin, dual vanities and an elegantly shutter window to the bedroom. The balcony offers two comfortable daybeds, table and chairs as a private retreat. The rooms enjoy an extensive range of amenities with exclusive Ayodya Palace bathroom toiletries. All rooms feature: deluxe mini-bar, deluxe tea and coffee making facilities, satellite 32″ flat screen TV with a wide range of channels, stereo connected to the TV for in room movies, Broadband Internet Access, in-room safe, centralized in-room environmental control system, three telephones and a data port. This room type is available in king or twin configurations. Connecting rooms are available. Individually designed rooms offer honeymooners that little bit extra. Each room, providing 56-79 sqm of spacious living, is named after fragrant Balinese flowers. Each features a traditional Balinese four-poster bed, with all rooms offering a double daybed and garden furniture on the terrace or garden courtyard. All rooms have a small, private foyer entrance area and the spacious bathrooms have a bathtub for two, separate shower, dual vanities and exclusive Ayodya Palace amenities. All rooms also feature: deluxe mini-bar, deluxe tea and coffee making facilities, satellite 32″ flat screen TV with a wide range of channels, stereo connected to the TV for in-room movies, Broadband Internet Access, in-room safe, centralized in-room environmental control system, three telephones and a data port. Ideal for the traveler in need of a little more space or the perfect honeymoon retreat, the Ayodya Palace Suite features separate bedroom and living rooms covering a 115 sqm. The suite enjoys elegant décor, teak parquet floors and spacious marble bathrooms with separate shower cabins, dual vanities, and a bathtub for two with exclusive Ayodya Palace bathroom toiletries. The living room features sofas and chairs, a cozy dining area, two double daybeds on the balcony and a mini foyer with guest bathroom. All rooms also offer: a deluxe mini-bar, deluxe tea and coffee making facilities, two satellite 32″ flat screen TVs with a wide range of channels, stereos connected to the TVs for in-room movies, Broadband Internet Access, in-room safe, centralized in-room environmental control system, four telephones and a data port. Located in the ground floor, this villa-style suite enjoys an area of 160 sqm and features a private garden, plunge pool, sun deck and outdoor dining pavilion. The Mandavi Suite has a large bedroom with integrated living area, spacious bathroom with walk-through closet and dressing area, dual bathtubs and separate power shower with unique multi function power shower, dual vanities and exclusive Ayodya Palace bathroom toiletries. The extensive private garden area makes this suite the perfect honeymoon retreat. 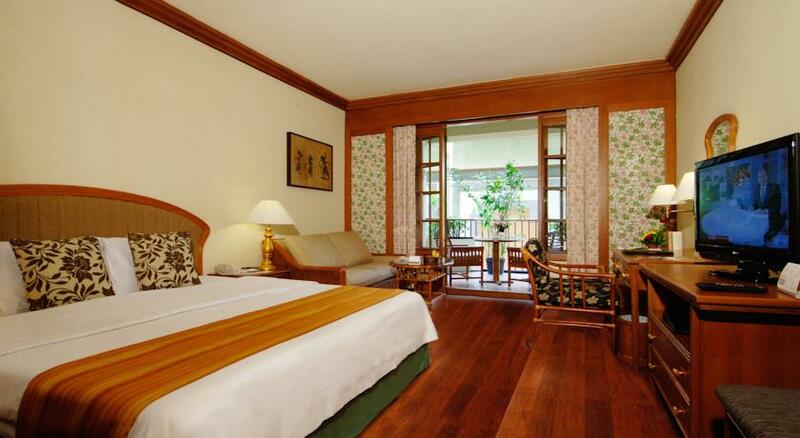 Located on the top level of the Ayodya Palace, this suite is complemented by stately teak furniture. The bedroom with a ‘stateroom’ bed is separated from the main living and dining room section and an extensive balcony area leads off these. The suite enjoys a total of 167 sqm of space with views across the Indian Ocean. The spacious marble bathroom includes separate shower cabin with power shower with unique multi function shower, dual vanities, and dual bath. A powder-dressing room is part of the facility. The suite also has a spacious entrance foyer with guest bathroom. In a separate Ayodya wing, three stunning sea-facing Rama Shinta Suites are locatedon three levels and feature a massive floor space of 206 sqm each, with private entrance foyer, guest bathroom, large lounge and dining area, spacious kitchen, enormous bathroom with separate power shower with unique multi function power shower, dual vanities and exclusive Ayodya Palace bathroom toiletries. The large master bedroom has a traditional Balinese four-poster bed and large walk in closets. All the rooms of each suite lead onto a private, integrated terraces and have access to a pool exclusively available for Rama Shinta Suites guests. Ideal for honeymooners, or with their large kitchen and availability of a connecting door to secondary bedroom, also provide perfect apartment-style living for families. Located on the ground floor with beachfront access, this very private villa-style suite is a perfect honeymoon retreat, offering plush interiors and a spacious layout over 524 sqm, including large, private tropical garden areas with plunge pool, cocktail area and open-air dining bale. Strategically placed daybeds, separate lounge and dining areas with guest bathroom, a bedroom with four-poster, king size, canopied bed, an enormous bathroom with built-in marble bathtub, sauna, separate power shower with unique multi function power shower, walk-in wardrobe and closet complete this suite to provide guests with the ultimate villa accommodation. Located on the top level of the Ayodya Palace, the suite spans 227 sqm with stunning panoramic vistas across the resort and over the Indian Ocean toward Mount Agung. The suite, offering a masculine interpretation and stately sense of opulence, is accessed via grand double doors leading into a private foyer entrance with guest bathroom, which leads into a spacious lounge with dining and living space and a separate service kitchen. The large master bedroom features an oversized stateroom bed, writing desk and seating area with a spacious bathroom complete with a handcrafted, specially designed marble bath and separate power shower with unique multi function shower . The suite features a connecting door to a second bedroom, if necessary. The whole suite faces onto a large balcony with stunning panoramic views. The room enjoy an area of 48 sq metres, designed in subtle tunes with timber fittings and offers views over the tropically landscaped gardens. Individual balconies, marble bathrooms and traditional Balinese artwork provide a perfect retreat. All rooms contain minibar, coffee and tea making facilities. All rooms have satellite TV with a wide range of channels available. The room type is available in king or twin configurations. This room enjoy an area of 48 sq metres, offers partial balcony views over the Indian Ocean. Tastefully decorated with subtle tones and timber fittings the room is the perfect holiday accommodation. Each room features individual balconies, marble bathrooms and traditional Balinese artwork as well as minibar and coffee and tea making facilities. All rooms have satellite TV with a wide range of channels available. The room type is available in king or twin configurations. 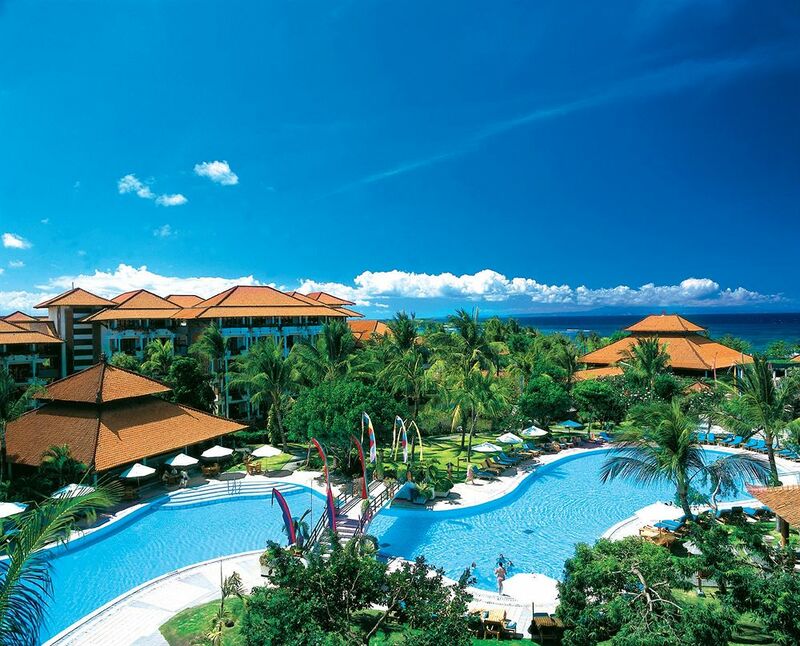 There are a host of recreational activities that you and your family can enjoy at the Ayodya Resort Bali. For starters, you can drop your children off at our Camp Ananda. Here, they can let their hair down in our playground under the watchful eyes of our Guest Activities Attendants or your baby-sitter. Other facilities include a large swimming pool, all-weather tennis courts, two squash courts and a health club with gymnasium. For golf enthusiasts, the 18-hole golf course is just next-door. As for water sports, there are facilities for surfing, snorkeling, diving, parasailing and wind surfing. Other facilities include a large swimming pool, all-weather tennis courts, one squash court and fitness centre. For golf enthusiasts, the 18-hole golf course is just next-door. 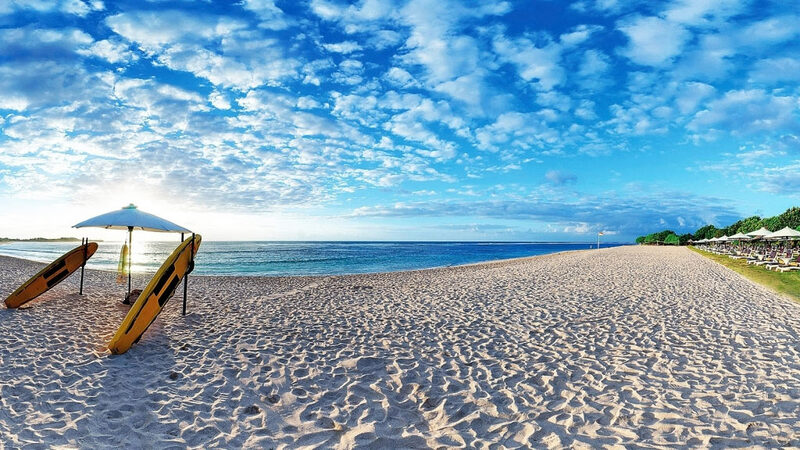 As for water sports, there are facilities for surfing, snorkeling, diving, parasailing and wind surfing. The two indoor tennis courts at Ayodya Resort Bali is so much more than just another facility. Private lessons and special packages are offered here, ranging from Social Tennis, Cardio Tennis to packages for couples or even for the family and little ones, all managed by PURETENNIS, a company that provides tennis management program to resorts and clubs around Asia. Ayodya Resort Bali is proud to announce the opening of its spectacular new spa, Ayodya Spa by Mandara. Embracing the four elements of fire, earth, wind and water, Ayodya Spa by Mandara invites guests to ‘Experience the Senses’. The contemporary design is exciting, eclectic and earthy, honouring the environment and touching on the traditional, while also retaining the very best elements of Balinese artistry. Families will be glad to learn that children are well catered for with a range of outdoor activities and special menus for youngers. Our Camp Ananda offers a well-equipped play room and a safe, enjoyable playground. In these areas children under 5 years old must be accompanied by a parent or a baby sitter. Our Guest Activities Coordinator is full of suggestions and is always there to keep you and your family totally engaged in fun and activities. The neighboring golf course operated by Bali Golf and Country Club offers 18 delightful holes with fabulous vistas of the Indian Ocean. Voted “One of Asia’s 5 Best Golf Courses” it will certainly give you an experience to remember. Set amidst landscaped surroundings thw mini golf course provides enjoyment in a picturesque setting for golfers of all ages. The nine holes are named after some well-known Balinese attractions such as Uluwatu or Goa Gajah. Located in the vicinity of the kids playground. An extensive range of watersports are available for all ages. Surfing, parasailing or windsurfing are on offer for the more adventurous as well as boat trips for those after something more leisurely. Snorkeling and scuba diving can also be arranged. A more leisurely pursuit can be found at our beachside table tennis tables. Our activities staff are on hand to team up if you are short of a partner. In keeping with Balinese traditions and Ayodya’s reputation for excellent cuisine, a variety of our restaurants serve regional and international dishes that make for enjoyable dining in Bali. These restaurants provide an excellent venue for conference and incentive groups. The Private Beach Garden can also accommodate up to 1500 people for private dinner. A variety of international and local dishes are available for room service on a 24 hours basis. Serves breakfast, lunch, and dinner with snacks and barbeque items for lunch and dinner. Enjoy balmy breezes and the beautiful Balinese sunset by the beach. Open from 7.00am to 11.00pm. Features Mediterranean cuisine in an informal atmosphere with a bar counter for drinks and cocktails. Specialty pizzas are also served from our wood-fired pizza oven. Open from 6.00pm to 11.00pm. Offers a wide selection of light snacks, cakes, specialty coffees, and teas. Located at the main lobby overlooking the lagoon and the ocean. Open from 8.00am to 12.00 midnight. Specialty Japanese Restaurant featuring teppanyaki tables, sushi counter, and private Tatami Rooms in an authentic setting. Open from 6.00pm to 11.00pm. Located at the main lobby overlooking the lagoon and the ocean. It is the perfect place to unwind at sunset while sipping your favorite cocktail. Open from 8.00am to 12.00 midnight. Nestled next to the main pool. It is the ideal spot to grab a quick bite in between swimming and sunning. Snacks, pizzas and a selection of cocktails or mocktails are the specialties. Open from 10.00am to 6.00pm. Serves breakfast, lunch, and dinner. Open 24 hours with its a la carte menu of international and Asian dishes as well as nightly themed buffets. A traditional open-air amphitheatre where Bali’s rich cultural heritage comes alive. Classical performances and Balinese dance are combined with international and Indonesian buffet dinners under the stars. The atmosphere is charged with expectation as everyone takes their ringside seats, while the Gamelan orchestra fills the night air with its clear metallic sounds.